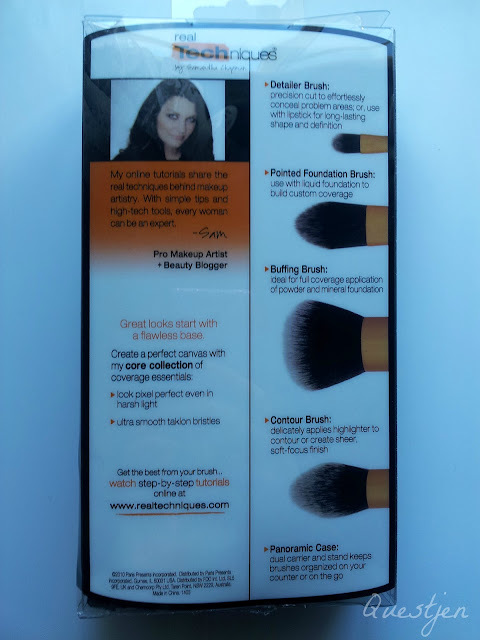 So I'm sure by now most beauty enthusiasts would know of these Real Techniques brushes by Samantha Chapman. I found out about these brushes from tweets by fellow beauty bloggers and I didn't understand why there was so much hype about them. After my tweet where I was asking my followers, 'who is Samantha Chapman?' and then I felt a little dumb when many people replied with 'she's one of the Pixiwoo sisters'. I'm sure it's not expected that everyone would know who the Pixiwoo sisters are but I guess as a beauty blogger, for me to not know them may seem a little surprising. I had heard of them before these Real Techniques brushes! It's just that I didn't know their names, what they looked like and anything about their YouTube videos. Thus I had no idea that they had their own line of brushes until they were made available in Oz. 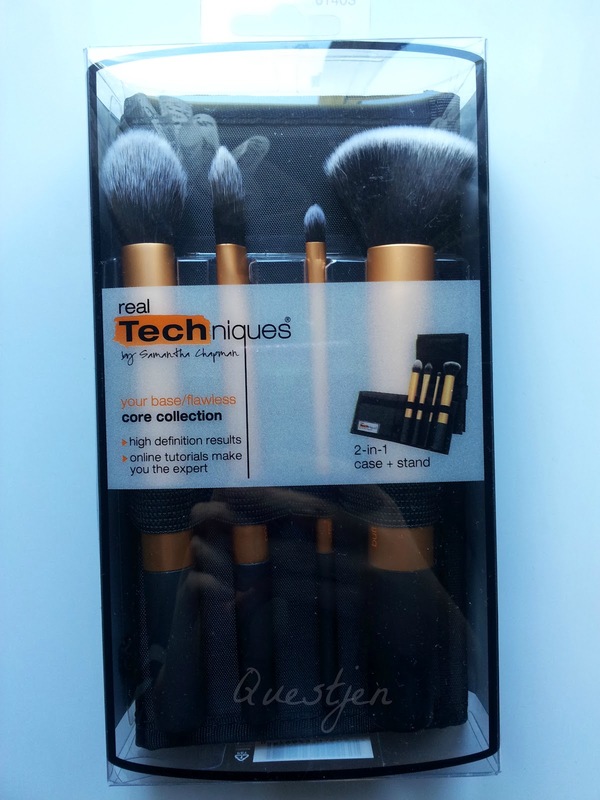 I must start off this review by saying that the hairs of the brushes are incredibly soft (they're synthetic taklon bristles by the way). They feel sturdy and look very professional. I had no doubts about the quality when I first laid eyes on them, both online and in real life. I'll be reviewing each brush individually in the same order as the back of the box. I don't think it can be seen in the picture above but the shape of the hairs are not like a typical concealer brush as it has a point to it - the hairs go inwards towards the middle. Okay that probably doesn't make sense so I will rephrase it by saying that the hairs are shorter on the edges are are longer towards the middle to create a point. Does that make sense? Ahaha I swear it sounds a lot better in my head... I'm really not that good with words yet I still continue to be a beauty blogger. Now onto a bit about the hairs itself. I measured the hairs being exactly 1cm from the pointy tip to the top of the ferrule (the metal that holds the hairs). The bottom half is black and the top half is white - I think it's safe to assume that there were two different synthetic fibres used to create this brush. This brush is perfect for me because the hairs on top are more fluffy yet are still dense enough for using concealer to cover any problematic areas. I haven't tried using this brush on my lips ('cause I'd like this one to remain as my concealer brush... I'm not into the idea of using the same brush to do different things) but I am sure that it would be great for that too because Samantha said so, hehe. When I first saw this brush I thought to myself, 'wow it's such a small foundation brush... wait is it even a foundation brush?' /confused/ And then I read the back of the box where it said that it was indeed, a foundation brush. Now compare that with the Real Techniques Pointed Foundation brush... it's the complete opposite. Before anyone makes assumptions, I just want to quickly say that I am not complaining - I'm simply comparing. 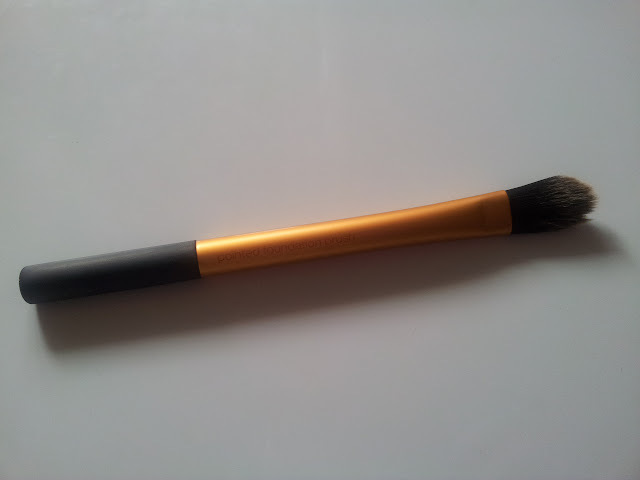 The foundation brush that I normally use is significantly different to the Pointed Foundation brush and purely because of this I had troubles adapting while using the Real Techniques one. It just felt different as it's lighter, much less dense (again, two synthetic fibres) and is about a third narrower in width. Different is okay though, right? Right! I can conclude that the Pointed Foundation brush was still effective when applying liquid foundation. I don't really have a preference when it comes to hair density for foundation brushes... just as long as it doesn't leave too many streak marks and doesn't make my foundation look cakey. 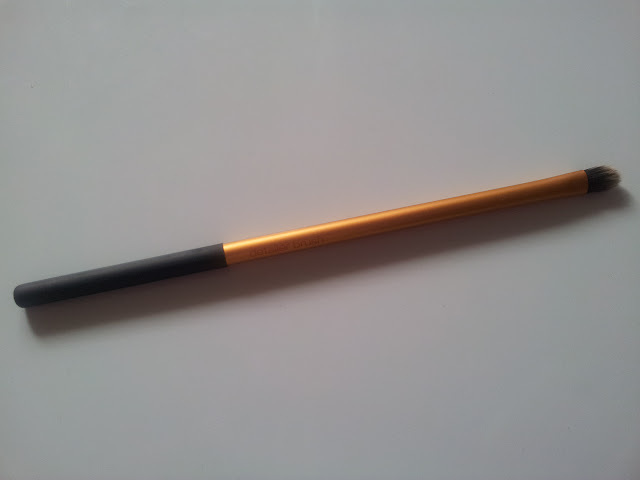 The width is 1.5cm - never had I come across a foundation brush that narrow! I found that while using this brush, it did require a little more time and effort when applying foundation as it didn't pick up as much product as a wider brush would. Get what I mean? They say that time and effort pays off in the end... that's true with this foundation brush if you want to achieve the flawless look! It precisely builds custom coverage. A+. You know what this brush reminds me of? My Sigma F80 Flat Top Kabuki! Good thing they're not similar or else I would be going into details with a comparison, haha. I don't have any mineral foundation which is a pity because I would have wanted to test it out with that. I do have powder though - powder foundation and translucent powder. The hairs are SOOO soft and very pleasant to use over my entire face. It didn't make my powder foundation cakey, in fact it blended it all extremely well. Same with the translucent powder... it left no white streak marks or spots. 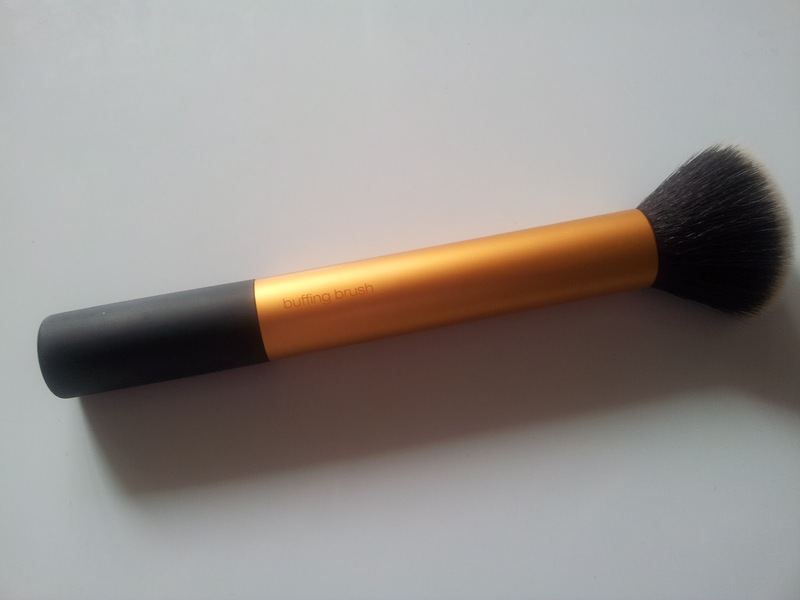 This is currently my favourite brush to use for powder! It's also great to use after applying my foundation to smooth out any streaks and even out any foundation if needed. 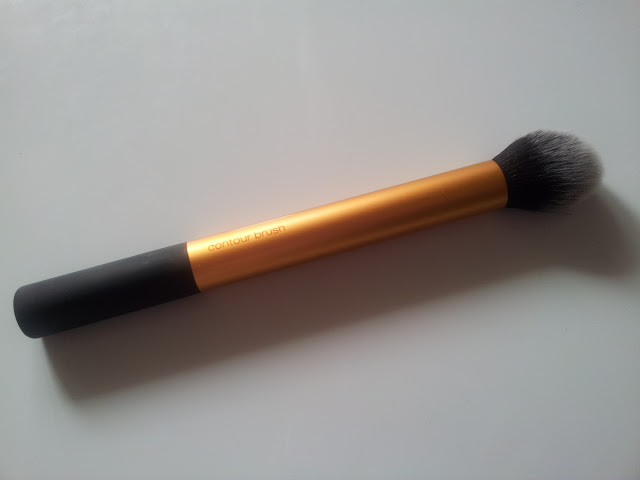 My first contour brush! It's like an oval fluff ball hehe, I love it ^^ Very soft and bendy bristles which are suitable for highlighting areas such as the forehead, under the eyes, on the cheek bones and the nose bridge. And since I've mentioned nose bridge, I might as well add in now that I also tested this brush while contouring my nose. It worked fantastically! So pleased and impressed. Usually nose contouring or any type of contouring can look a little unnatural (depends on technique too) but one who may have little technique can get away with natural-looking contouring thanks to this brush (an example would be myself lol!). I admit that I lack contouring skills, thus I am too afraid to go out with a contoured nose even though it would look better in photos. I think that I can now confidently leave the house with a contoured nose after using this brush to do it. It definitely creates a soft-focus finish. The brushes were great while cleaning as there wasn't any shedding or colour fading. The individual pictures of the brushes were taken post cleaning - have a look for the quality yourself :) They're still looking great! Here is a short video of me demonstrating the ways this case can be used and my thoughts on it. Sorry about the vertical shot - I recorded it on my phone and I thought that it would turn out being widescreen but obviously not ;( Noob me. Next time I'll shoot horizontally... if there is a next time. Thank you so much again Priceline for holding such an amazing Twitter competition!! And thank you, my readers for sticking around right to the end. As my way of saying thank you... I will have something for you all to look forward to next week. Actually I think I'll just say what it is now since you guys are so awesome. Mm, I'll be holding a giveaway! What type of brushes are more important to you - face or eye brushes? Fancy set. These look really nice, and I certainly would like to try them. However, I still prefer flat foundation brush. I just got these brushes but I haven't really had a chance to test them out yet. Your review was super helpful! 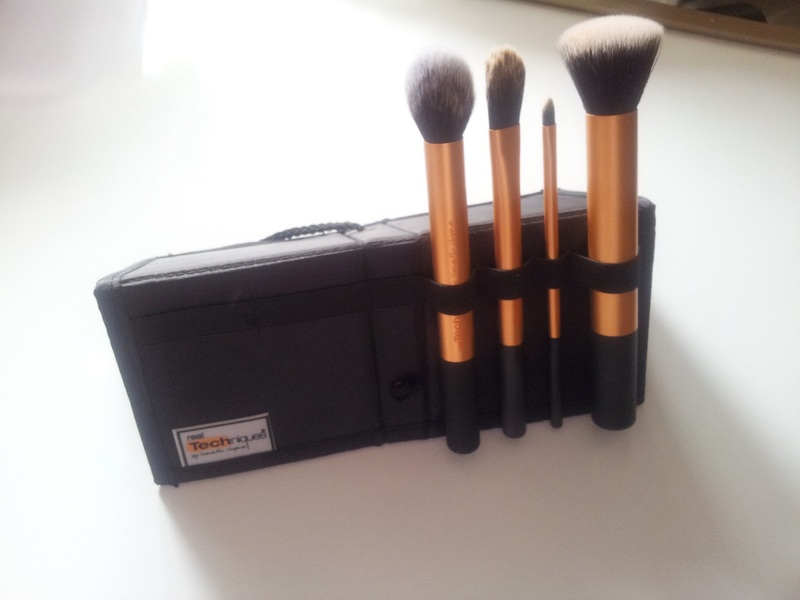 I also got the blush brush which I really love! 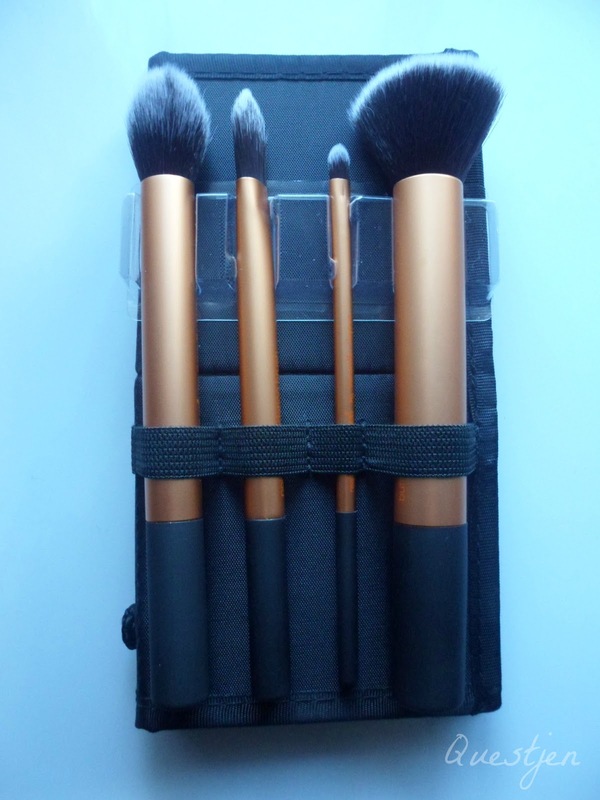 Aw thank you for your feedback Kimberley :) I want to get their blush brush! i wish they sold these brushes in canada!